Does a Dickens novel need an introduction? Well I will say that I am pleased with myself for having read this 1841 classic as it is the first proper classic that I have read all year. The novel begins with little Nell and her grandfather as they lose the Old Curiosity Shop, due to the grandfather's gambling debts and are forced to flee onto the roads of England. The story follows their progress, and the progress of the "saints and sinners" who either love and have aided little Nell and her grandfather, or have contributed to their downfall. Many years ago, I read A Tale of Two Cities by Dickens and found myself completely mesmerized by that novel. I enjoyed The Old Curiosity Shop very much, but am finding it difficult to think of ways to describe it. There are also aspects to the novel the I found quite irritating. One of aspects of the novel that I found fascinating is that it reads like something that was serialized, which of course it was, as it was published in weekly instalments in one of Dickens's serial publications. I found it quite nostalgic (in a good way) to be reading chapter after chapter and imagining English folk, back in 1840, eagerly anticipating the next part of the story. I also enjoyed Dickens's description of the places Nell and her grandfather pass through. He is the absolute master of capturing the poverty and struggle of the working classes of the time. As they pass through one of the northern industrialised cities, the reader experiences all of the darkness, noise, filth and scurrying humanity of those streets. A painting could not say as much. Poverty is explored in many different contexts in the novel. The archetypal "baddies" that Dickens does to perfection, while not materially poor, are certainly morally bankrupt, and often quite funny I found. I think what could be exasperating to the modern reading palette is that most of the characters don't have any sort of moral ambiguity; they are either pure, wholesome and without fault, or they are sinister and forever plotting evil deeds. I say it could be exasperating, because I actually found this quite fun; a bit like a fairy tale for adults. There is also something quite fresh and completely recognisable about many of the interactions and dialogue between the characters. The cast of characters is epic. 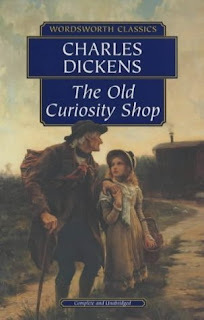 I am not sure, but suspect that The Old Curiosity Shop of the title refers to the ensemble collection of people in the novel, as much as the bricks and mortar shop at the beginning. The characters are all certainly memorable, often because of their extreme nature, unusual, occupation or physical characteristics, but as a complete volume, I am not sure that it all ties together as well as some of his other work. 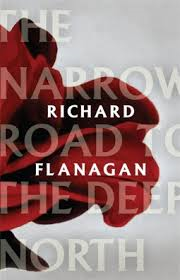 And perhaps it is unfair to compare it to his other novels, as it was not originally published as a novel. While I risk stating the bleeding obvious, I think my enjoyment of the novel suffered a bit from differences between our eras. Some of the scenes that were emotionally loaded seemed a bit overblown to me. One of the themes that Dickens explores throughout is the neglect and mistreatment of children in the Victorian era. I found one of the most evocative and poignant examples of the cheapness of childrens' lives at the time, is a young female servant character who has no name at all. My major peeve with the novel is the character of Nell's grandfather. I wanted to shake him, right up until the end in fact. I guess this could be a tribute to Dickens's wonderful characterisation, but I just found him completely annoying and pathetic. In fairness, I am sure the grandfather was meant to be broken and pathetic, and I have not read a better account of a gambling addiction, ever. It amazed me, that Dickens's portrayal of the itch and compulsion associated with gambling, resonates just as strongly in the western society of today. Overall, the suspense of the novel builds very nicely, and true to form, Dickens had me cheering for the oppressed and eagerly awaiting the downfall of the conniving oppressors. While not my favourite by this literary giant, it is great story telling, and I am very pleased I took the time to read it. I would love to know what others think of this novel and Dickens's work generally. Which are your favourites? I started reading this book a few years ago but couldn't get into it. Your review makes me think I should probably try it again. I'm still undecided on Dickens in general, as I haven't read enough of his books to really make up my mind. My favourite so far is Our Mutual Friend. Dickens is one of my favorite classics authors. I think my favorite of his so far is A Tale of Two Cities, with Great Expectations a close second. I have The Old Curiousity Shop and Barnaby Rudge on my shelf to read when I want to read him again. Chris - Thank you, and I will be sure to keep an eye out for the three you have suggested. shereadsnovels - I think the pace definitely picks up, I have found that with the three of the Dickens novels I have read so far. There are some very memorable parts in the last third of the book to do with the conniving machinations of the baddies, that I really enjoyed. TheBookGirl - I love him too. A Tale of Two Cities moved me greatly when I read it. I will be sure to add Great Expectations to my list, even though I feel like I know that story backwards from watching a couple of the dramatized versions. Though I daresay the book will always add something and usually is more involving. Fantastic review Mel. This is one I haven't read yet but am looking forward to reading it.